Christianus Prolianus’s Astronomia, Latin MS 53, f.1r (detail). Several of our Latin manuscripts have recently been fully digitised at the request of Professor Kate Cooper, in support of the MA in Medieval Studies at The University of Manchester. 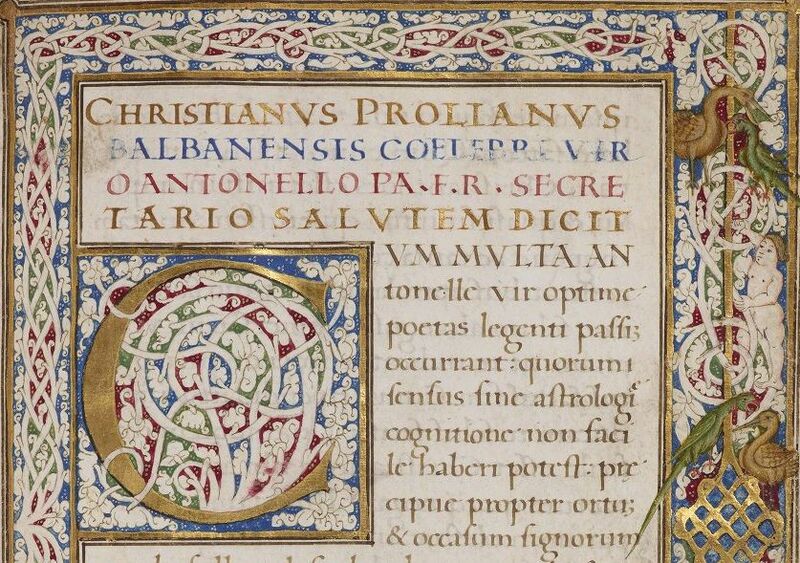 Among them is a spectacular humanist manuscript of Christianus Prolianus’s scientific treatise, Astronomia. Very little is known of Prolianus, except that he came from the little town of Balbano in Tuscany and he was associated with the Neapolitan court of Ferdinand II. Although the book is entitled Astronomia, it is concerned with the elements and geometry as well as astronomy. The manuscript was produced around 1478 (the Library also holds a copy of the first edition, printed in Naples by Henricus Alding in 1477, pressmark 18518). It is written on vellum in a beautiful humanist script. The text is illustrated with a series of dazzling astronomical diagrams – images of the Sun, Moon and planets are decorated with gold leaf – and there are also ornate astronomical tables. Elaborate white-vine borders herald the start of each chapter, embellished with parrots and other birds, animals and putti. The illumination has previously been attributed to Gioacchino di Giovanni de Gigantibus. However, Andrew Phillips, a student on the MA in Medieval Studies course who has made a detailed study of the manuscript, has pointed out several stylistic differences between this manuscript and Gigantibus’s corpus. The manuscript has an interesting provenance. 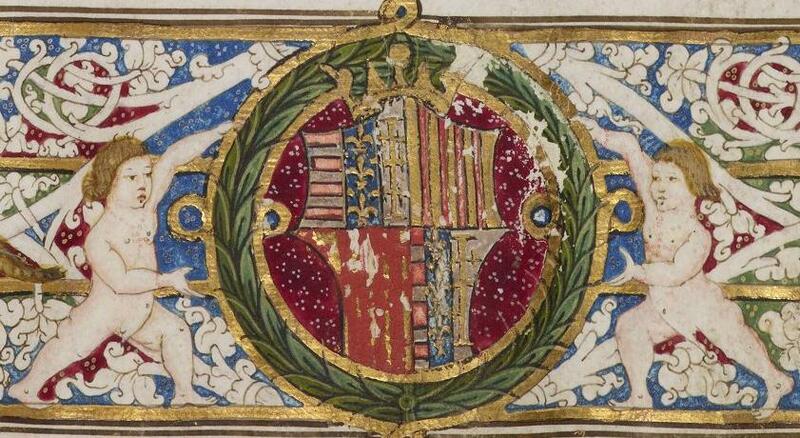 Andrew Phillips has identified the coat of arms on f.1r as that of Cardinal Giovanni of Aragon, son of Ferdinand II and a noted bibliophile. In the late 19th century it was owned by William Morris, designer, author and socialist. He later sold the manuscript (he bitterly regretted parting with it) and it was purchased by the 26th Earl of Crawford for £42! To view the complete manuscript, click here. Beautiful images and enticing description! I am very interested in the Prolianus astronomy and in its illuminator. Unfortunately, I cannot access the full manuscript by clicking on the link, not can I find coordinates for Andrew Phillips. I would be very keen to read his MA paper, as I am particularly interested in Gioacchino de Gigantibus.